This easy to make sweet potato casserole recipe has been in my family for many generations. This sweet potato casserole is so easy to make. It does use canned yams instead of sweet potatoes that you have to prepare yourself. It saves a ton of time and none of my family members have ever complained! It’s as simple as heating them on the stovetop and adding simple ingredients. It also has a streusel topping, mini marshmallows, and added honey to enhance the flavors in this already flavorful dish. This sweet potato casserole is not only easy to make but it’s a dish that is perfect for Holidays and even potlucks. It takes very little time to make and it’s something that guests always expect to see at Holiday dinners (in my family anyway!). You can also save cleanup time by using disposable foil trays to make and serve this in – no added dishes and no need to track your dish down later! It can also be changed to suit personal tastes by leaving the streusel topping and the mini marshmallows off or by leaving them on. This recipe calls for honey and if you left it out it would still taste good. My grandmother always added honey to her casserole and my mother always does the same – it’s really up to you! It enhances the flavor of the dish, so you should at least try it! 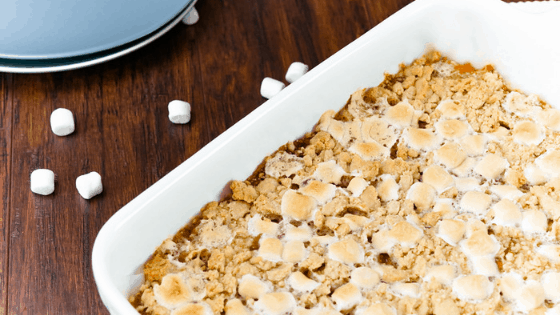 Homemade sweet potato casserole with streusel topping and mini marshmallows. Melt together 1/2 cup of brown sugar, butter, cinnamon, and the 1/2 cup of reserved syrup from the can in a medium-sized pot. Add in the yams and mash. Heat until well combined. Butter the bottom and sides of 9x13 casserole dish. You can also place parchment paper on the bottom of the dish. Evenly spread the mixture in the casserole dish. Drizzle the honey over the sweet potatoes. Layer 1 cup of mini marshmallows on top of mixture. Prepare the streusel topping by adding melted butter, flour, brown sugar, and salt into a small bowl and mixing until well combined. Crumble and spread the streusel topping evenly. Top off with the remaining mini marshmallows. Bake in the oven for about 30 minutes.